This is a new box by Flambeau designed by American "bass master elite" world champion Mike Lanonelli. 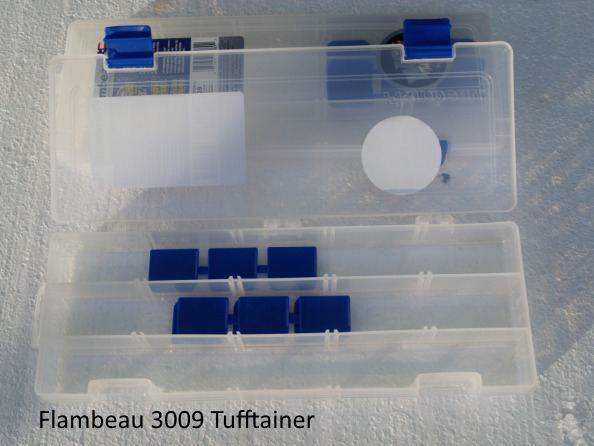 With three extra long compartments in a small box, capable of being subdivided in to 15 smaller compartments which are about 30% longer than normal tufftainer compartments. 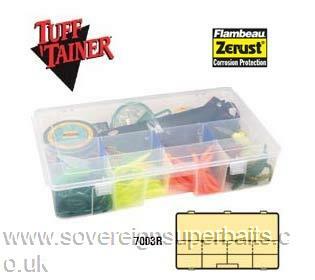 The box is 31.5cm X 11.5cm X 3.4cm (12 1/2" X 4 1/2" X 1 1/4") & comes with 9 "Zerust" deviders which help prevent rusting of tackle. This is a very useful size & lends itself to many applications. 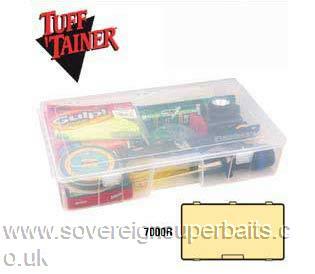 16.50" x 9.75" x 3.25"
Regrettably due to the changes in Royal Mail postal parameters these tackle boxes now cost us £3.75 to ship to you when bought on their own. Other products can of course travel inside them. If you want to buy more than one of these 7000 series boxes, email or phone us & we can send you a paypal invoice with a better postage option. 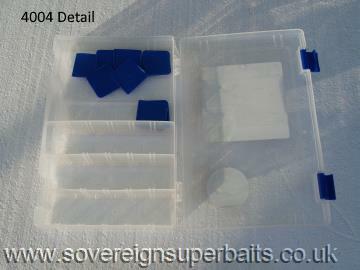 2 to 10 boxes will travel for £6.50. : Multi-purpose see-through utility boxes with durable no spill latches. Worm proof. 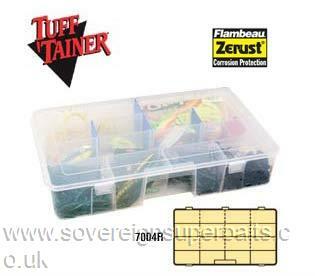 For less than the price of four boxes you get four "5004 Tufftainers" & a free bag to carry them in !